“Bound” is really, I think, where Fringe kicked off. After what seemed like an eternity between this episode and the previous one (over a month between the two), it picks up straight after Safe. This is really the first time we’ve had an episode like this, one not completely standalone, and it proved there’s more to Fringe than simple Monster-Of-The-Week stories. It starts off lightheartedly enough. You know, the usual drugging of bugs which I’m sure is a nice family pastime for many of you, until Astrid spoils the fun we all know Peter’s secretly having by informing them Olivia has gone missing. Olivia gets a spinal tap to determine whether she had Cortexiphan in her system – the results, we know, were positive. Broyles orders a search for Olivia which isn’t necessary as she breaks herself out anyway, stealing a few samples and killing/knocking out a few guys in the process. She hides the samples and calls Broyles before she’s surrounded and taken by the man who is secretly our favourite character, Sanford Harris. His talk with Olivia in the hospital provides a nice little recap for any new viewers, telling us about Walter’s insanity, Peter’s having been arrested seven times and the fact this all started off with John Scott, Olivia’s former partner and lover. Then there’s a little conversation with Charlie which reminds us that it was Olivia who was the reason behind Harris’s arrest for molesting three women. In the Pilot, we see Broyles is resentful of Olivia for that, calling Harris’s crimes a “small lapse in judgement” so I think it’s interesting now to see with whom his loyalties actually do lie. We’re introduced to Olivia’s sister, Rachel, and Olivia’s niece, Ella, who gives Olivia a Magic 8 Ball. It’s nice, I think, that they introduced these characters because it shows a different side to Olivia which we haven’t really seen since the first scene of the Pilot. I think both of these characters are important because at the time Olivia was getting a lot of criticism from some fans for being wooden and two dimensional – her family gave her an extra dimension, they showed there is more to her than her work. Olivia seems to remember Peter exists and calls him to tell him that she needs Walter to identify the samples she stole. 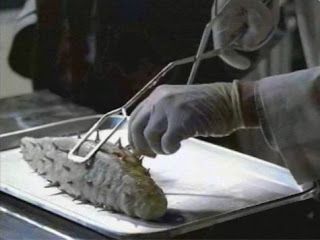 Suddenly we’re at a college and there’s a giant slug tearing its way out of a professor’s oesophagus. The giant cold virus is a particular favourite Monster-Of-The-Week of mine for no reason other than I’ve never found anything that really shouldn’t be as cute and adorable as I found that. Apart from the worms in Snakehead. But that’s a story for another time. Peter, Olivia and Walter go to investigate the giant virus and after Walter catches it and takes it to his lab and he tells us that the slug was developed from the same materials as those samples Olivia stole earlier. There’s one line that stands out to me here: “My boy, I'm not even sure that we all exist on the same plane of consciousness.” As a lot of Fringe is focused on perception, and what is or isn’t real is referenced quite a lot (especially in earlier episodes) it makes me wonder whether, now we’re up to season three and looking back, if we were being given some sort of clues either about the Observers or about where Peter’s consciousness may have gone or even if those two places are one and the same. We then see Broyles showing us exactly where his loyalties lie, and they’re not with Harris. It just shows how far, after only eleven episodes, these characters have come. We find out from the TA the unfortunate professor was having an affair with that he had just got a big job with the CDC to oversee the country’s preparedness to fight off an epidemic, which reminds me a little of Frank from the alternate universe with their many epidemics. Mitchell Loeb tells Olivia he’s going to coordinate the investigation on her abduction before she brings in a man she believes to be the next target, Russell Simon. After a bit of bickering with Harris (who doesn’t love having him around, right?) Peter calls to tell her they’ve made a breakthrough – all the victim has to do to be the next lucky home for a giant cold virus is ingest the “yellow powdery stuff” from the vials Olivia stole. Which is just what Simon does. After the organism tears its way out of Simon’s mouth we go back to the lab where Walter tells Peter and Olivia just exactly what it is, “a single specimen of a virus for the common cold”. We see Rachel talking with Olivia about how Olivia has “always been the strong one” which is proven later in the series, after all Olivia goes through. Olivia asks about Rachel’s ex, showing that while Olivia is focused on her job, she’s also got a family she cares about, too. At the office, Olivia drops Ella’s Magic 8 Ball and notices Loeb’s shoes have the same white spot as her abductors’ because apparently people wear their work shoes when performing a kidnapping. A bit contrived, but each to their own. There’s a lovely scene next with Charlie and Peter, where Charlie asks for Peter’s help in tapping Loeb’s phone, and, of course, Peter knows a guy, which is pretty useful because the minute he starts listening in, he hears Loeb telling his wife to kill Olivia, who is at their house. There’s a fight between Samantha Loeb and Olivia, and Samantha ends up shot through the head. They lure Loeb to them using Samantha’s phone and arrest Mitchell, but not before Olivia pistol-whips him. Loeb is brought in for questioning and tells Olivia that there are two sides to a war and that she’d just blown their plan, and that he hadn’t kidnapped her, he’d saved her, but wouldn’t explain further. Although it’s not really one of the more memorable episodes of early season one like, for example, The Arrival or Ability, it’s one of my favorites because it took the characters to a bit of a new level, it fleshed them all out a little such as Olivia with her family, or Peter, trusting the FBI enough to contact someone from his shady past to put a wire tap on an agent’s phone. The title of this episode is interesting, too. Who is bound to what? Loeb to ZFT? Broyles to his agents rather than his old friend? Olivia to her job? 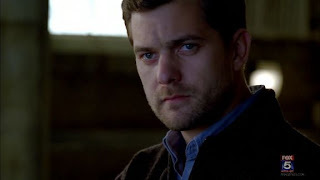 Or Peter to his new role in the Fringe Division after a life of being a nomad? This episode shows he cares about more than just answers. We know Olivia’s a good fighter, but without Peter’s wire tap and warning for Olivia, would she have come out of the fight with Samantha unscathed? This episode had a strange, avant-garde beginning for me. Due to an iTunes store glitch, I wound up with no dialogue track. (The music and sound effects were there, but when people's lips moved, nothing came out.) Since it's Fringe, and strange things happen, I thought that perhaps this was some kind of experimental episode! I wasn't absolutely sure that something was wrong until we got to the Sanford Harris scene. It's surprising how well the beginning works with no dialogue at all. I really like your view on the title of this episode. Personally, I love looking at the titles to find a deeper meaning. At first I thought it was "Bound" as in "What are our characters bound for next?" or after Olivia's abduction, introduction to Harris, and Loeb's speech to her- "What is Olivia bound for next?" I also thought since it is episode 111 and we're half way through the season- "What is Fringe, as a show, bound for next?" from an audience point of view, where are we headed? I feel like this is an episode where we can say with confidence- "We're bound for a great 2nd half of the season." But like I said, I love your take on the title because I didn't really think about it that way at first. I love these reviews so much, interesing indeas, especially the part " if Peter never existed" keep up the good work! -Dosing with LSD – need I say more. -Olivia ends up bound, just like in Entrada and then later Fauxlivia in Bloodline. -If they would have succeeded with persuading her what would have happened? -Who was Sanford Harris working for? -I think Olivia displayed one of her biggest strength in this episode and that is to stay focused, not matter how dire the situation. She had enough wits to focus on the shoe and then find a way to escape (glass of water), just like in 3.01 Olivia when she remembered the elevator code and then came up with a way to escape (not being able to breathe). -That’s the second time when ask if she’s ok, she said “no, not yet”. -I think Harris was so adamant about getting rid of her, not just because what she did to him before joining Fringe, but Olivia was interfering with his plans. If he could he would have had her killed right then. -How did Harris know about Olivia and John? -Ella gave Olivia the 8 ball which shows up again in 3.12 Concentrate and ask again. 8 is also Olivia’s number. Sam knew she’s size 8, it shows up throughout S2. In Earthling there is a door number 8 right by her head, In Snakehead when they leave Matt’s house, the number is 4488, in Jacksonville the building number is 2280, in White Tulip Walter holds two molds together which form an 8 as Olivia sits there with him, in 6B the number on the police car was 4738. I played around with it came up with this: 4 +7= 11, 3+8= 11, 8-3= 5, 7-4= 3, 5+3= 8 which is Olivia’s number. 8 also stands for infinity. 11+11=22 which is the strongest number. 22 shows up in 3.15 Subject 13. Olivia sits at the table when she sees Peter for the first time and 22 is right behind her. -Love how the intro doesn’t show up until 15 minutes into the episode. -Every time Walter does something gross, he also thinks of food. So does Peter. Astrid says, like father, like son, which ironic because Peter is not. -Walter says: “My boy (the Observers call Peter that too) I’m not even sure that we all exist on the same plane of consciousness.” Hm – foreshadowing S4? -Broyles is not very good at picking friends. This is the first of at least two that are bad and end end up dead. The second one being Van Horn. -Love the Peter/Olivia moments in the lab. -Call me crazy but I don’t believe that Rachel is Olivia’s biological sister. There is just something about her. Rachel says to Olivia: “You’ve always been the strong one.” That’s the same phrase Bell uses for Olivia. I also believe that Rachel didn’t tell Olivia everything, when asked if there was more. Just my opinion. -Is Greg the same husband she moved to Chicago with in 3.06 Amber 31422? In 2.03 Fracture, Peter talks to a genius about the radio frequencies. Is this Kyle here the same genius? -Why did Olivia disclose her case to Sam, was she suspecting her as well? -Love the expression on Olivia’s face when she gets her revenge (for lack of a better word) by hitting Loeb. -There would not have been a wire tap to warn Olivia. Would Samantha have been able to kill her? -Would they have been able to catch Loeb? Hi there. :) Nice points regarding the title. Love your catch on the number 8 being Liv's number(guess that's why Ella gives her the Magic 8 ball, and the "22" being the P/O number. I'll have to keep watching for those. I'm not sure exactly who Harris worked for, but I think it was someone higher up the food chain than Jones. Regarding Rachel not being Liv's biological sister...well, remember "Brown Betty," where Rachel was a hired actress? That may have been foreshadowing something, we'll have to wait and see.